Manjushri is the Boddhisattva of wisdom and learning. He holds his left hand in the teaching mudra, while simultaneously holding a lotus flower with a book resting on top, representing wisdom. He holds a sword in his right hand, which he uses to cut through illusion. 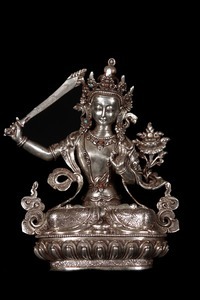 For Mr. Rosborough, Manjushri represents the compassionate wisdom, knowledge and skill to see things as they really are in order to get to the heart of conflict for the most effective and efficient resolution.